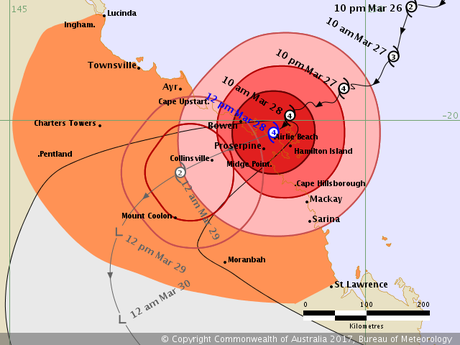 Cyclone Debbie (Category 4) has made landfall. More than 20,000 were without power through Mackay, Whitsundays. UPDATE: TROPICAL cyclone Debbie has weakened further to become a Category Two however the system is continuing to wreak havoc as it moves inland over Queensland. A wind gust of exactly 100km/h was recorded by the Bureau of Meteorology's gauge at Moranbah Airport, about 400km north west of Rockhampton, at 7.52pm. Meanwhile the systems core has moved over Collinsville where there were earlier reports of tin roofs being blown off homes. The system is expected to lose its cyclone status between 5am and 8am tomorrow morning however the category ranking plausibly won't mean much for those being impacted. Dozens of communities are now on flood watch with a massive area placed under warning - stretching all the way from Mackay to the New South Wales border. EARLIER: THE army has been called in to clean up Queensland's disaster zone after Cyclone Debbie smashed into the Whitsunday region, unleashing howling winds of 260 km/h. It downed trees, stripped buildings and left shorelines swamped after making landfall as a Category 4 storm at midday near Airlie Beach and is expected to continue wreaking havoc for the rest of the week. At 7pm it was downgraded to a Category 2. A man suffered serious injuries after a wall collapsed and authorities are warning there could be deaths as the impact of Cyclone Debbie is likely to last up to five days. Police Commissioner Ian Stewart said the full damage would not be seen until Wednesday. "Tomorrow we'll see lots of structural damage. I'm just hoping we don't see loss of life," he said. EARLIER: RESIDENTS in the tiny Queensland town of Collinsville have rallied to help each other as Tropical Cyclone Debbie bears down upon them. The town which has a population of less than 2000 residents looks set to be impacted by the now Category Two Cyclone in the next few hours. However posts on the Collinsville Community Notice Board indicate the wind is already causing serious damage. "The sheets of tin are coming off my roof and as each one comes off it loosens the next one," Cassa Tandridge posted this evening. "What am I supposed to do? A rope over it would definitely help but it's a 2 story house so we can't get to it. At what stage do we try to call someone for help?" Meanwhile other locals were keenly offering help. Winds in nearby Proserpine are still husting to mor ethan 120km/h according to the latest data from the BoM. EARLIER: THE tiny Queensland town of Collinsville tonight finds itself straight in the path of Tropical Cyclone Debbie as the system bears down from the east. Earlier Debbie unleashed widespread damage across the Whitsunday Islands, Bowen and Mackay before lifting roofs as it passed directly over Proserpine. 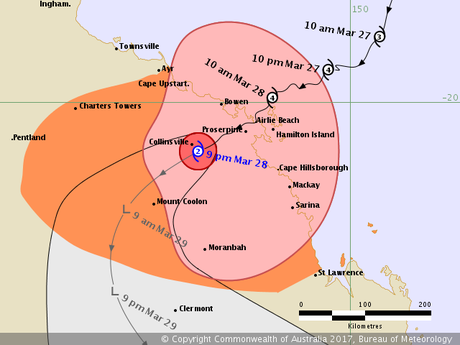 The system has now been downgraded to a Category Two cyclone after initially crossing the Queensland Coast as a Category Four. And there are still reports of very strong winds in areas the core has already passed over. The BoM's weather modelling suggests the system will continue to unleash remarkably heavy rainfall - as much as 200mm in three hours in select areas. The BoM's weather modelling presently shows Debbie will sink to 986HpA at its core at 8am tomorrow morning. 985HpA is the minimum low pressure required for cyclone status, however, the purple patches indicate rainfall of more than 150mm in three hours. Weather data from the BoM shows the strongest wind gust recorded was 263km/h at Hamilton Island at 10.25am. On the mainland a gust of 148km/h was recorded at 2.24pm at Bowen and Propserpine witnessed a gust of 165km/h at 3.19pm. EARLIER: A MAN has suffered serious injuries after a wall collapsed and authorities are warning there could be deaths as the impact of Cyclone Debbie is likely to last up to five days. Cyclone Debbie made landfall between Bowen and Airlie Beach shortly after 12pm, with the eye wall impacting the Whitsunday islands and nearby mainland after smashing Hamilton Island. On nearby Daydream Island extensive damage to the iconic getaway resort has been reported as staff work to assess the impact. 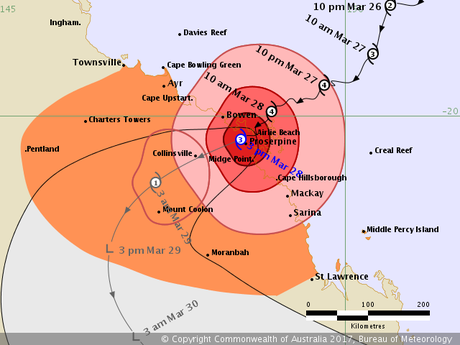 At 3.04pm Bureau of Meteorology downgraded the cyclone to Category 3, but wind gusts up to 205kmh were still predicted as it moved slowly inland and it has already been declared a "catastrophe" by the Insurance Council of Australia. At 6pm the system had wind gusts of more than 125km/h were still occurring and was about 25km west of Proserpine, heading for Collinsvile. Reports suggest 50,000 homes were without power. TC Debbie is now forecast to slowly track westward throughout the evening before colliding with the small town of Collinsville about 11pm. From there it is expected to track through inland Queensland bringing five days of floods and havoc before breaking back out to sea at the Sunshine Coast. A massive area stretching more or less from Mackay to the New South Wales border is presently subject to a flood watch. EARLIER: THE latest information from the Bureau of Meteorology says the core of Tropical Cyclone Debbie has now moved over Proserpine and is headed towards Collinsville. However there are still warnings in place for dangerously heavy rainfall and strong winds. The tiny town of Proserpine - home to just more than 3000 people - copped a direct hit from TC Debbie with footage emerging on social media of roofs being lifted off homes. For the next couple of days a massive flood watch warning has been issued with the areas impacted stretching all the way from the Mackay region to the New South Wales border. And while the core of the cyclone may be set to weaken and pass into less populated areas there are still reports of extreme winds in areas as far from the system's centre as Bowen where there are reports of corrugated iron sheets flying through the streets. Meanwhile at Airlie Beach at least one yacht has broken its mooring. EARLIER: THE Bureau of Meteorology has now downgraded Tropical Cyclone Debbie to a Category 3 however authorities are warning the system will continue to unleash very strong winds and torrential rain. The cyclone is presently hovering to the north west of Proserpine and is slowly making its way towards Collinsville. "Gusts over 125 km/h are occurring about the coast and islands between about Cape Upstart and Cape Hillsborough (north of Mackay), including Bowen and Proserpine, and may extend further west along the coast to Ayr during this afternoon." Collinsville and Mount Coolon are expected to cop the worst of the weather this afternoon while Townsville, Charters Towers, Mackay and Sarina are no longer expected to get very strong winds. EARLIER: A MAN has been injured by a collapsing wall and authorities are warning there could be deaths as the impact of Cyclone Debbie is likely to last up to five days. Police Commissioner Ian Stewart said authorities were expecting deaths from Cyclone Debbie. He said there were reports of one man injured in Proserpine. "(He was) hurt badly by a collapsing wall in Proserpine," Commissioner Stewart said. "We don't know the condition of that person at this time. "Sadly, I think that we will get more reports of injuries, if not deaths." Authorities are warning the impact of Cyclone Debbie could last up to five days. EARLIER: THE small town of Proserpine is in the eye of the storm now as Cyclone Debbie begins her path inland dropping torrential rain and bringing damaging winds. The first images from the system's path of destruction are also starting to emerge with Higgins Storm Chasing posting a photo of a storm surge at Seaforth Beach. EARLIER: QUEENSLAND Police Commissioner Ian Stewart has warned residents in towns impacted by Tropical Cyclone Debbie to stay inside and watch out for looters. Commissioner Stewart made the remarks at a press conference with Premier Annastacia Palaszczuk about 2.50pm today. "There's some other very key messages that need to be adhered to and that is as the danger passes completely and that will happen for most places overnight, and in to tomorrow morning, we need people, if they possibly can, to stay off the roads, because emergency service vehicles and personnel will need to be going into all areas as quickly as possible," Commissioner Stewart said. Please take note if you don't need to go out, don't." Commissioner Stewart also warned of hoarding. "There will be lots of personnel coming in to the damaged areas to do risk assessment," he said. "I'd ask people to keep note of those individuals. The last thing we also wanted is any person who takes advantage of the situation for looting purposes. And we ask, if you see someone who you suspect, please take photos and provide them to police immediately." The news comes as a flood warning comes into play for most of the Queensland coast - all the way from north of Mackay to the New South Wales border. The cyclone is now forecast to track inland bringing rain to regions around Emerald before turning back towards the the east and hitting the Fraser and Sunshine Coasts on the weekend. 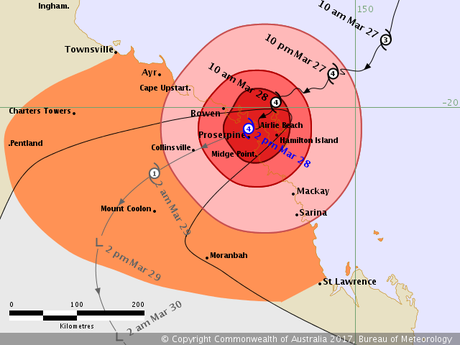 EARLIER: THE latest information from the Bureau of Meteorology shows the small town of Proserpine is now more or less directly in the eye of Tropical Cyclone Debbie. Latest weather observations show that while winds in Proserpine are still immensely strong they have dropped back slightly - the latest reading shows gusts up to 137km/h where at midday the same station showed a reading of 159km/h. The next towns in line to cop the centre of the storm are Midge Point and Collinsville, however, the system is expected to a category one cyclone by the early hours of tomorrow morning. By that point it's forecast to be half way between Collinsville and Mount Coolon. EARLIER: CYCLONE Debbie has made landfall between Bowen and Airlie Beach, after smashing Hamilton Island. The destructive core was hitting north of Airlie Beach at 1pm (AEST), rather than just to the south of nearby Bowen as was previously forecast. Debbie is moving at 11km an hour, and wind gusts are hitting in excess of 270km/h. Queensland Premier Annastacia Palaszczuk has called the impact of Cyclone Debbie a one in 100 year event. "What we have seen just south of Proserpine is rainfall in excess of 210 millimetres that has fallen within the past hour. Cyclone Debbie: Boat destroyed: Sailing boat swamped at Sarina Beach. This is equivalent to a one in a 100 year event so the Bureau is modelling that information now but we are seeing unprecedented levels of rainfall in that area," Ms Palaszczuk said. "The Bureau cannot rule out that it could even intensify to a Category Five. The Whitsundays in the eye of Cyclone Debbie. 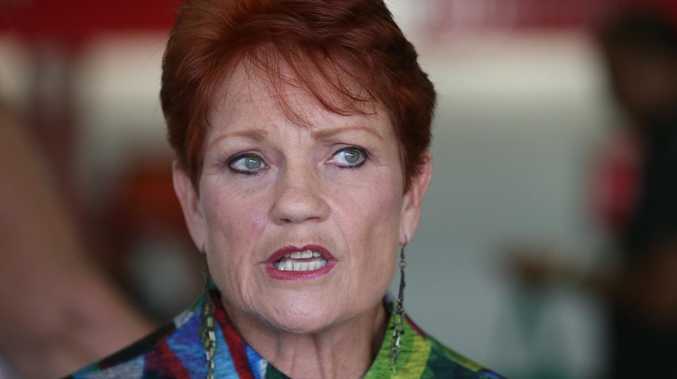 "This is going to be a very frightening day for a lot of families in regional Queensland." Queensland Police answering triple-zero calls have told of increasingly panicked calls for help from across the region. Flying debris is visible as cyclonic winds pummel Airlie Beach and the Whitsundays. Bits of tin and tree debris can be seen in the swirling vortex of winds inside the very destructive core of Cyclone Debbie. 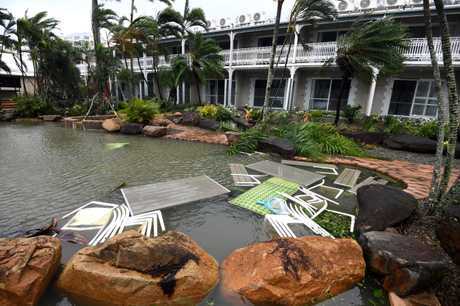 Airlie Beach and surrounding communities are already in the grip of destructive winds and torrential rain that's caused damage to homes and flooding. The cyclonic pitch of the winds - like jet engines on take off - has risen audibly as the eye closes on the coast. Debbie's eye began to hit the Whitsunday Islands about 7am. Those taking shelter on the island say the wind is so strong brick buildings are vibrating, and the wind sounds like a series of freight trains charging through. Destructive winds with gusts over 125 km/h are occurring about the coast and islands between about Bowen and Midge Point, including Proserpine, and will extend further along the coast to areas between Ayr and Sarina during this morning or afternoon. The Category Four tropical cyclone has touched down between Bowen and Airlie Beach and will now begin moving inland through the rest of Tuesday. Those in Airlie Beach are reporting that it has grown eerily quiet, and the eye may be passing overhead. Wind gusts near the centre of the eye are still reaching 260kmh with "sustained winds" near the centre are topping 185kmh. Bowen, Airlie Beach and surrounding areas are most at risk of facing the cyclone's "very destructive core" with the Bureau of Meteorology warning wind gusts could reach 270kmh near its centre. 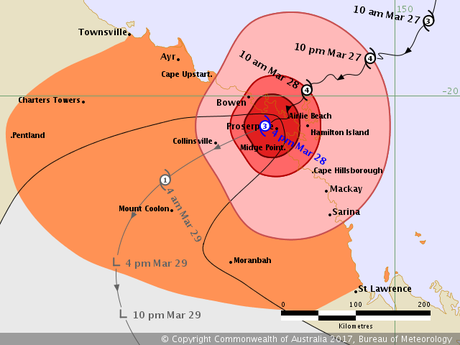 Mackay is no longer expected to be hit by the worst of the cyclone's destructive winds. Rainfall totals from some rain gauges around the Mackay region include 470mm at Mount William, 340mm at Clarke Range, 232mm at Mt Jukes and 226mm at Sarina - (in the 24 hours to 9am, yesterday). The BoM's gauge at Hamilton Island recorded a wind gust of 224km/h at 12.30pm - with the wind blowing in a northwesterly direction. Meanwhile about 50km away at Proserpine the wind was recorded blowing at 165km/h - in the opposite direction. As Mat Garner who was on holiday on Hamilton Island said: "The roar was so loud, wind was phenomenal, all the windows rattled and shook violently!" At least 34,000 people have been left in the dark throughout the Whitsunday, Bowen and Mackay regions due to Cyclone Debbie, Ergon Energy reports. Those between Abbot Point and St Lawrence are specifically warned about a dangerous storm tide, although Mackay Mayor Greg Williamson has said that threat has largely passed for Mackay. He told ABC News 24 with the passing of high tide "the storm surge did not eventuate". Cr Williamson said Mackay's greatest danger was now the threat of localised flooding as massive rainfall begins to soak the region. Already the swelling Pioneer River that runs through the middle of Mackay has begun to flow over a bridge. Off the coasts of Mackay and the Whitsundays, 110 hulking ships have had to scramble to safety as Cyclone Debbie approached. It is thought most have headed south towards Gladstone where the waters are safe, deep and relatively free of destructive storms. Queensland Regional Director, Bruce Gunn said estimated sustained wind speeds were at the upper end of Category 4 strength in the range of 185-195km/h, with peak gusts to 270km/h. A peak gust of 263km/h been recorded at Hamilton Island today. "Gales are forecast to impact communities between Lucinda and St Lawrence and inland to Mount Coolan and Moranbah for up to 36 hours after the system makes landfall," he said. Although the strongest winds are near the core, damaging and very destructive winds can extend several hundred kilometres from the cyclone's centre. Sea levels have exceeded the highest tide of the year at Shute Harbour and Laguna Quays. The Bureau is also warning for abnormally high tides, large waves, storm surge and rough to phenomenal seas. "Severe Tropical Cyclone Debbie will deliver significant rainfall as it tracks over land, with flooding another major impact of the system. This is a dynamic and changing flood situation, please check the Bureau's website for the latest warning information," Mr Gunn said. Widespread daily rainfall totals between 150-250mm are expected with the passage of the cyclone, with isolated falls in excess of 400mm possible along the coastal fringe. Observations in the Mackay region (in the 24 hours to 9am, Tuesday, 28 March 2017) include: 470mm at Mount William, 340mm at Clarke Range, 232mm at Mt Jukes and 226mm at Sarina. Cyclone Debbie: the top videos so far: Cyclone Debbie is hammering the Queensland coastline. HAMILTON Island has copped 263kmh winds as the eye of Tropical Cyclone Debbie hovers over the Whitsundays. The potentially-devastating cyclone is expected to cross the coast within hours - some time between 1pm and 2pm - between Bowen and Airlie Beach. The cyclone's power was on show even with it still 35km north north west of Hamilton Island, with the shocking wind speeds putting fear into those yet to face its wrath. The storm is moving southwest at 9kmh. CYCLONE Debbie is crawling toward the Queensland coast at just six kilometres an hour but the eye wall is already making a big impact on the Whitsundays. While Debbie's track is changing slightly through the morning, forecasters expect Bowen to suffer the most direct hit. Deputy Police Commissioner Stephan Gollschewski says roofs are lifting in the Whitsundays region and there are reports police facilities there have been damaged. "We're getting some reports already of roofs starting to lift, including at some of our own facilities in the Whitsundays," he told ABC television. Tourist Helena Mo is among those taking shelter on the Hamilton Island and says it's been scary. "I have never heard gusts of wind howl this loud and this intense before," she said. Swell from Debbie hits Mackay Harbour: The swell from Severe Tropical Cyclone Debbie has hit Mackay Harbour. "You can't help but worry about what's going to happen next." - 194mm of rainfall at Strathdickie (near Proserpine) in the one hour to 7.45am. - Wind gusts of 232km/h at Hamilton Island airport at 9.30am. - Wind gusts: Bowen 91 km/h; Mackay 96 km/h; Proserpine 117 km/h; Yeppoon 61 km/h. Debbie's eye began to hit the Whitsunday Islands about 7am. It's expected to make landfall on the mainland about midday (AEST) as a severe category four storm packing wind gusts of up to 270kmh, just south of the town of Bowen. At 9am on Tuesday, the warning area remains from Lucinda to St Lawrence, including Townsville, Mackay, and the Whitsunday Islands, extending inland to Charters Towers, Mount Coolon, Moranbah, and Pentland. 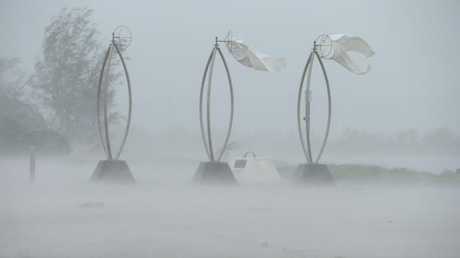 The Category 4 system has winds near the centre of 175 kilometres per hour with wind gusts to 250 kilometres per hour. Tree ripped out of ground collapses on house: A house has sustained damaged after a tree was knocked over by a gust from Cyclone Debbie. 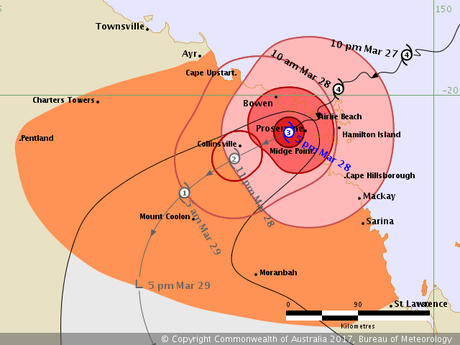 It is 75km east northeast of Bowen and 50km north of Hamilton Island. Severe tropical cyclone Debbie is forecast to make landfall on the mainland between Cape Upstart and Airlie Beach at about 2pm. 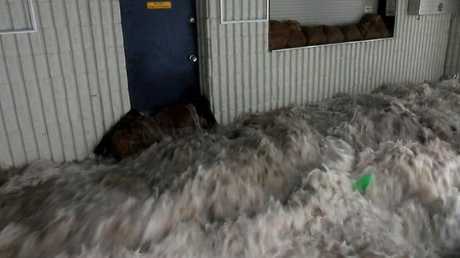 The Bureau of Meteorology said wind gusts of nearly 200kmh at Hamilton Island airport were recorded at 6.52am. Residents between Ayr and St Lawrence are specifically warned of the dangerous storm tide as the cyclone crosses the coast. The sea is likely to rise steadily up to a level which will be significantly above the normal tide, with damaging waves, strong currents and flooding of low-lying areas extending some way inland, the bureau warned in its 9am advice. "Areas of heavy rain with the potential to cause severe flash flooding have developed around the Central Coast and Whitsundays district. "These heavy rain areas are expected to spread to other parts of the northern and central Queensland coast and adjacent inland areas today. "Widespread daily rainfall totals of 150 to 250 mm, with isolated event totals of 500 mm, are also likely to lead to major river flooding over a broad area this week. A Flood Watch is current for coastal catchments between Rollingstone and Gladstone, extending inland to the Upper Flinders, Thomson and Barcoo catchments. ALMOST 200mm of rain has fallen in a single hour near Proserpine as Cyclone Debbie continues its destructive journey towards the coastline. 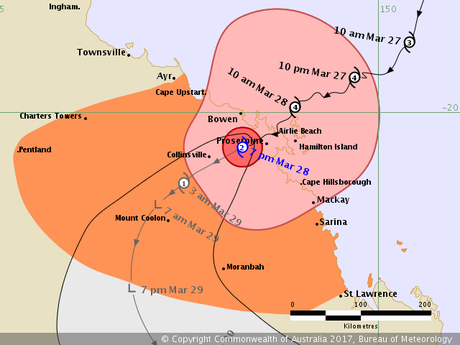 Cyclone Debbie is now just 85km from the Queensland coast, and is still predicted to head directly towards Bowen, north of Mackay. The township of Strathdickie, about 10km north of Proserpine has copped 194mm of rain in just 60 minutes between 6.45am and 7.45am. The Bureau of Meteorology has also confirmed earlier reports that wind gusts of almost 200kmh have buffeted Hamilton Island airport. In its 8am alert, the Bureau of Meteorology warns Cyclone Debbie is expected to cross the coast between Ayr and Midge Point, bringing with it winds of up to 260kmh. Already destructive winds topping 125kmh are striking between Bowen and Midge Point, including Proserpine. These will reach areas between Ayr and Sarina later today. Opinion Is it possible to find meaning in such an unthinkable tragedy?